How Do I Calculate Thermal Load for a Wine Cabinet Cooling Unit? 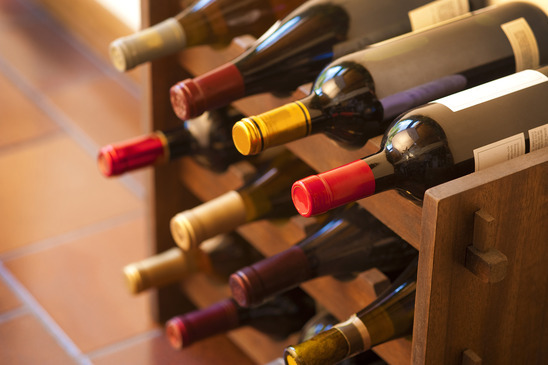 When buying a cooling unit for your wine cabinet, there will be questions along the way. 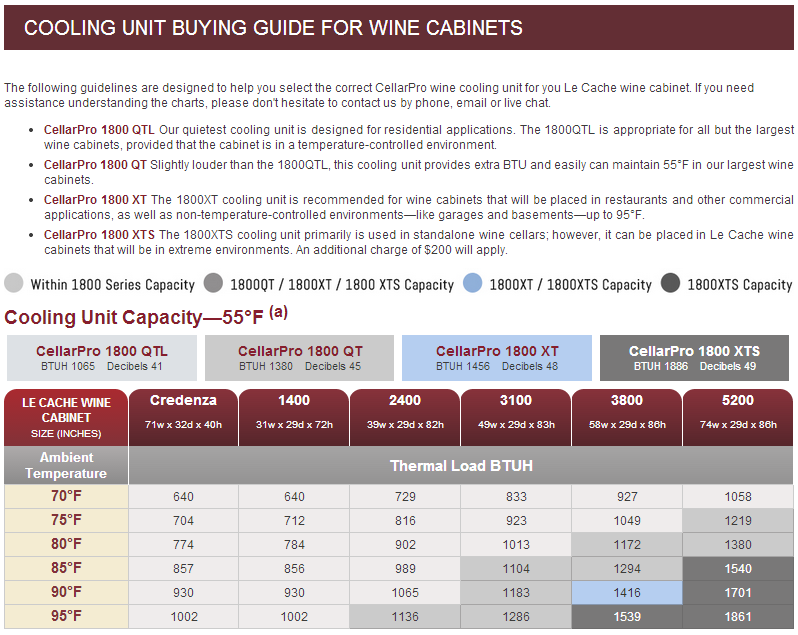 We often get follow-up questions to our Cooling Unit Buying Guide for Wine Cabinets, from people interested in the thermal load calculation methodology. Here’s a great one we received recently, along with our response. Q: I am looking at your Cooling Unit Buying Guide for Wine Cabinets and am having difficulty figuring out how the thermal loads were calculated. For the 5200 cabinet the 55°F table shows the thermal load increasing by 161 BTUH for each 5°F increase in ambient temp. So if I work backwards and calculate the thermal load at ambient temps of 65, 60, and 55°F I get 897, 736, and 575 BTUH respectively. Of course there should be zero thermal load at 55°F ambient temp so where does the 575 BTUH come from? This is more than half of the cooling capacity of the 1800QTL. If I do the same calculation for the 1400 cabinet, the 55°F ambient number works out to be 424 BTUH, so it’s not consistent. Perhaps you could explain the calculation methodology so I can make a more informed choice of cooling unit? The load consists of 5 main components: Transmission, Internal, Infiltration, Product and Safety. For the 5200 wine cabinet, the components lay out as follows. Transmission load is the temp load from the outside environment. At 55 ambient, the transmission load is 0. Internal load is the heat generated from the cooling unit itself and a light, both assumed to be on 24/7. Therefore, this load number doesn’t change as ambient temps increase. The internal load of the cooling unit is 170 BTUH, and the internal load from the light is 69 BTUH. Infiltration load is the latent load from moisture infiltration. At 55 ambient, the infiltration load is 24 BTUH. Product load is the load from the wine bottles. We assume 8 bottles at 80 degrees are added every 12 hours. (Obviously this would never happen, but we wanted to be conservative.) At 55 ambient, the product load is 46 BTUH. Safety load is our cushion. At 55F, the safety factor is 31 BTUH. When you add the components, they should sum to 340 BTUH at 55 ambient. In 5 degree increments, the sum increases to 617 BTUH at 60 ambient; 811 BTUH at 65 ambient and 1058 at 70 ambient. I hope this helps! Let me know if you have any followup questions. Want to know more? 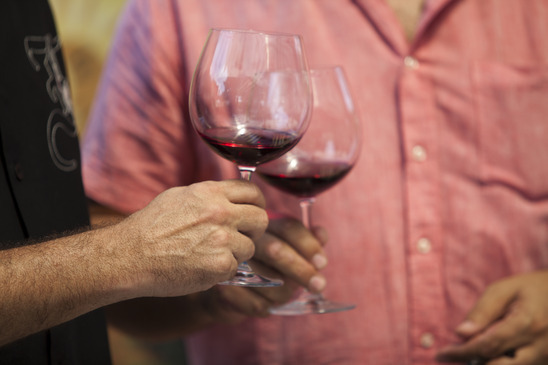 Read the buying guide to find your own wine cellar cooling unit online at IWAwine.com.